I liked Sparrow. It was a cool little email app that did everything I needed, and not much extra that I didn’t. It had an integration with CloudApp for those large file attachments, it looked nice, and it just worked. I was happy. Then they got bought out by Google, development stopped, and this would be perfectly fine if Sparrow didn’t just one day stop working on me. I am a bit picky about my email clients (or any software really). If I wanted to keep looking at “not so nice looking” software all day long I would have kept my previous job, so it has to look nice (subjective yes I know). I want it to work well. I don’t want a bunch of “features” to be forced on me that I in no way want to use. Shouldn’t be too hard to ask right? Turns out finding an email application that looks decent and at the same time doesn’t try to become my project & task manager at the same time is a hard thing to find. It seems you either have an app that does email well but doesn’t look good at all, or an app that looks really nice but tries to turns emails into tasks, and email isn’t broken. My email is actually all through Gmail/Google Apps, so Gmail works great when I am not sitting at my computer. I have nothing against using Gmail in the browser but as many browser windows and tabs I have open at any given time finding that one email tab is sometimes a pain. In my own workflows its just much easier to use an app. So there is this app called Mailplane which basically turns Gmail’s web experience into an app. What it does is takes the nice looking Gmail experience and then puts it in a dull frame, me being the picky app user I am this was no good! 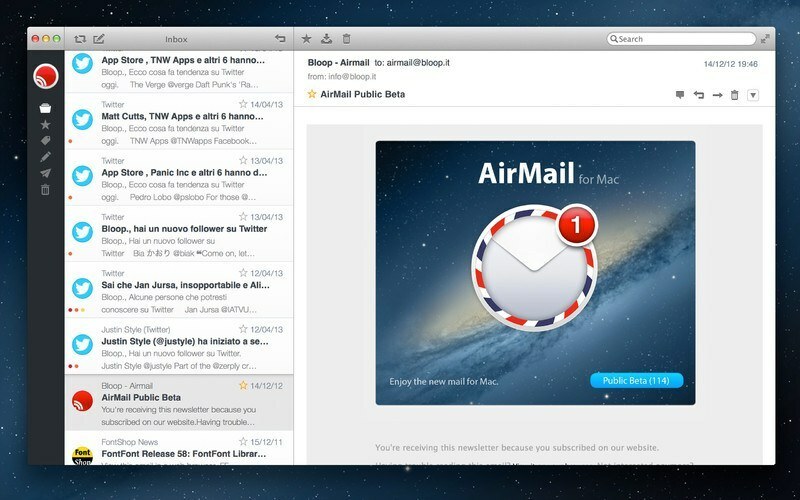 So in one of my searches around the internet for a good app I found Airmail. Reviews were hit and miss, either the user loved it or hated it. The common issue was something about having to reload all your email when you open it? I haven’t experienced that myself and have not had any issues myself beyond that either. It sort of looks and feels like Sparrow but improves on some parts that I wished were different about Sparrow. For example: I can integrate CloudApp, Droplr, and Google Drive all at the same time! Sparrow made me choose, and you I dont think Google Drive was even an option. I use CloudApp for myself and then Droplr for my work at WooThemes, so having both is really a timesaver for me. If you used Sparrow before and have been looking for a replacement app ever since you should at least take a look and consider it.